Join Our UF EM Team! 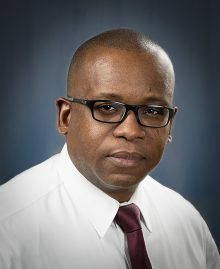 Dr. Tyndall is currently the Interim Dean, Professor of Emergency Medicine and the Chairman of the Department of Emergency Medicine at the University of Florida College of Medicine. He is a graduate of the University of Maryland School of Medicine and the Emergency Medicine Residency at the University of Maryland. In addition, he received his Master’s Degree in in Health Services Management and Health Policy from Columbia University Mailman School of Public Health, NY. He served on the board of trustees of UF Health Shands Academic Health at the University of Florida for 4 consecutive terms and is on the Board of Directors and current President of the Florida College of Emergency Physicians. He is a member at large of the Board of Trustees of the Society for Academic Emergency Medicine Foundation. He is the Chair of the Dean’s council for diversity, inclusion and equity at the University of Florida. He served previously as the senior medical school representative to the Council for Faculty and Societies at the Association of American Medical Colleges and was named a 2018-2019 fellow of the Council of Deans of the AAMC. His research interests include traumatic and ischemic brain injury, Infectious disease phylodynamics and health services research. He has been the Chair of the UF Health Shands procedural sedation committee for over 10 years. He has been Chairman of Emergency Medicine at the University of Florida since 2008.